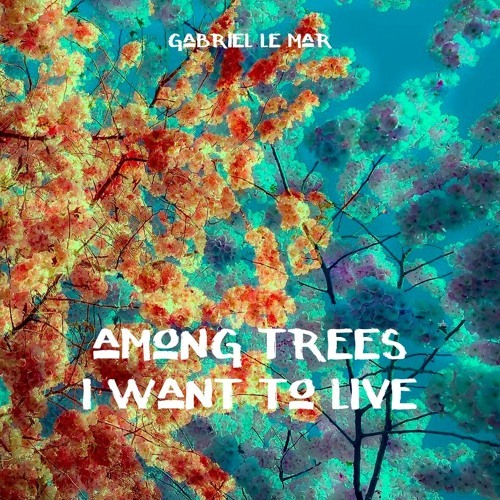 Gabriel Le Mar's album created in the studio but all tracks carry the essence of being among trees. And just like the lives of trees the album is full of mystery. With a wide range of deep groovin tunes and shades of Dub "Among Trees I Want To Live" is spanning electro acoustic sound to meditative patterns this music exist somewhere in the landscapes you can listen and dance to. The album opener "Regenerative" is a deep ridin' tune driven by its deep mood and catchy guitar riffs while "Imagination Creates" hypnotically moves through dub chord driven spaces and unfolds its moving in depth groove. "The Living Green" takes us on a trip into melodic synth patterns that find their counterpart in the electric pad like guitars. "Wisdom of Resistance" carries echoes throught the magic mystical forest in an epic but deep and patient arrangement while "Electric Leaves" is tripping through a mysteriously harmonic soundspace. "Days In The Tree" follows the same path continuing that special atmosphere dipped with indian sounds which leads to "Network Of Life": a smooth moving Tech track that Gabriel Le Mar created in collaboration together with young new artist Joey K. "Outside Of Time" rounds up the album with a smooth deep shuffling beat an intense synth and ebow touched singing guitar moods. Sounds that don't exist in nature but they create an atmosphere of tender closeness to the trees. Gabriel Le Mar according to his about facebook page is a music producer, living in Frankfurt/Germany, releasing electronic music with a special focus on deep DubTech sounds and Dub inspired TechHouse. With an open mind and always in a search for fresh musical experiences, Gabriel Le Mar likes to integrate himself in different artistic constellations with project pseudonyms such as Saafi Brothers and Aural Float into ambient, space and experimental sound scapes. Next to his music projects Gabriel also works with Aural Float on audiovisual concepts: as a team they did the artistic supervision of SPACENIGHT, a prototype of an integral TV-concept, utilizing spectacular film- and documentary footage from outer space with music made on earth. SPACENIGHT became a success on German television and soon reached cult status among the young night watchers until today. End-of-Days sound for the next generation. Life appearances at festivals like TimeWarp, Pollerwiesen, Roskilde, Fusion, Hadra, Sziget, Ozora, Tribal Gathering, Merkwürdiges Verhalten, Reworks, Vision. I follow my creative dream of experimenting, always trying something new and I hope it makes people wondering what you're up to. Music and ideas and it will always go on"